This Curcuma breeding program produces hybrids which combine long stems and beautiful inflorescence characteristics with attractive colors. In addition, each pot produces multiple inflorescence because each shoot produces a new flower, making the Sawadee™ and Chaidee™ Series even more outstanding! 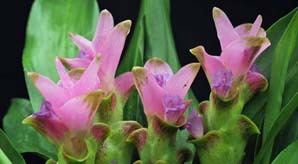 Remember, Curcuma does best in partial shade and will thrive in a rich, organic media. It should be kept evenly moist and prefers heat and humidity.